I set up across from Tia Queta, a charming Mexican restaurant in Bethesda, Maryland, and a family-owned business. As usual, passersby stopped by my easel to chat, and more than one emphasized how nice the owner of the restaurant is. Sure enough, the owner, Roberto, sauntered by to see what I was up to. He was indeed a delightful guy! He offered to move his truck -- that's it in the painting -- but I liked the truck and encouraged him to leave it there. In fact, the truck was probably the most successful part of the painting! I’m out of practice with plein air, having hibernated all winter, and I’d forgotten how fast the light changes — and how challenging it is to draw complicated architecture in an hour or so. I didn't get a great photo before delivering the painting, plus I wasn’t happy with my incomplete roof, so the top and side of this image are both cropped a bit. Roberto liked my effort, flaws and all, so I gave him the painting, and in exchange he treated me and my family to a free dinner — a very generous gesture! The food was terrific. I highly recommend the tamales. We will go back soon and pay full fare. 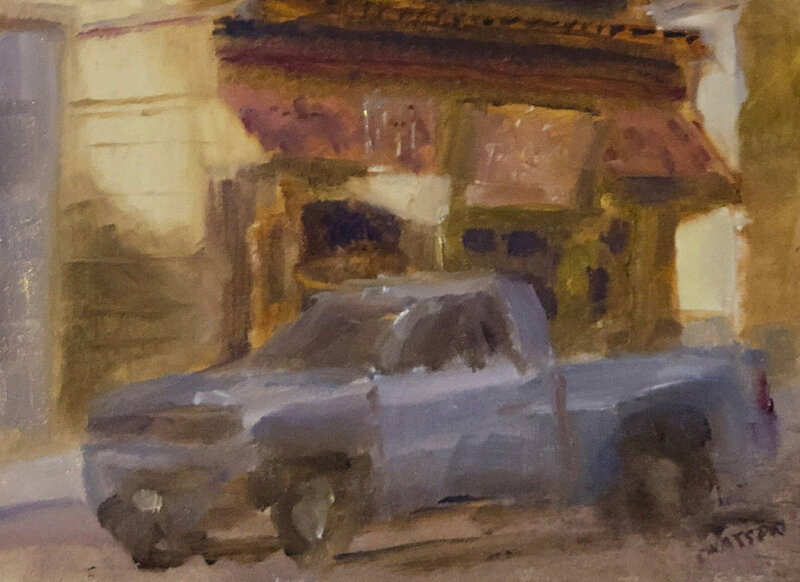 Geoff Watson, “Parked at Tia Queta (study),” oil on panel, 8” x 8” (detail), 2019.